Bladder stones in dogs are easily confused with simple dog bladder infections. While an infection does not always mean bladder stones, a urinary tract infection can be a symptom of stones. At some point, however, you may need to pay closer attention. If your dog has constant symptoms like blood and pus in her urine, she may have something more serious. Like dog bladder stones! 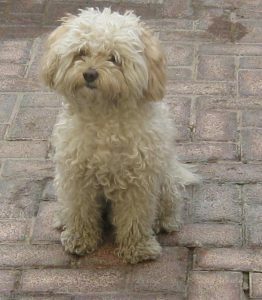 A Bichon Frise can develop kidney stones at any age. If your Bichon Frise dog has bladder stones, your first inkling might be a routine test by your vet that discovers blood in your dog’s urine. But, there are some other signs that you might not connect to canine bladder stones. You might also see these symptoms if your dog has skin allergies, food allergies, or seasonal allergies. Frequent peeing – Your dog might be driving you nuts, asking to go outside all the time. While your first thought is probably that she is manipulating you (perhaps for another treat? ), she may really be feeling a strong urge to pee. While frequent urination can be a sign of bladder stones, it can also be a symptom of diabetes. Accidents in the house – Dog incontinence or peeing in the house, is not common for a Bichon Frise female who has been house-trained. If your dog starts to have accidents after being house trained, she may not have control. A number of incontinence products for dogs can help keep your home clean and sanitary. Licking the genital area – When any dog does this, it is a sign that there is some discomfort or irritation in that area. Unable to pee – If you Bichon goes outside and tries to pee and nothing happens (or only pees a little), pay close attention. If this continues, your Bichon may have a medical emergency! Take her to the veterinarian immediately. If your dog cannot pee, the urethra may be blocked by a bladder stone. If the stone is not removed, the bladder can rupture. In addition, a bladder that has been stretched by holding too much urine, may not ever regain its muscle tone. If this happens, your Bichon might never be able to fully empty his bladder. This makes your dog more prone to getting another dog bladder infection or a recurrence of canine bladder stones. You can get cheap and easy to use bladder stone test strips from Amazon. You’ll also need a urine collector to take the test. So how can you make sure that your Bichon does not get bladder stones? There is, of course, no guarantee with Bichon Frises, that they will never get bladder stones. But there are some things that you can do. If you follow these preventative steps, your dog will have a much better chance of avoiding this common dog health problem! Plenty of water – Make sure your dog drinks plenty of water. Bichons like FRESH water, so make sure that the bowl is clean and the water is changed often. Otherwise, your Bichon Frise might not be getting enough water! Another quirky thing about Bichon Frises is that they sometimes refuse to drink after other dogs. So, if you have another dog or two, make sure your Bichon has its own dog water bowl. 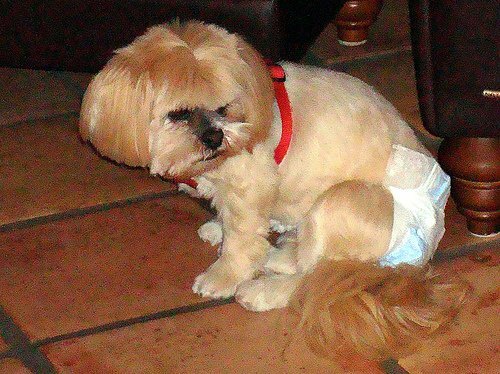 Pee frequently – Give your dog a chance to empty his bladder often. 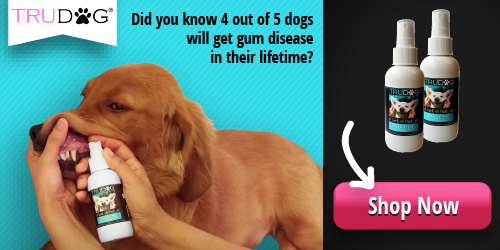 This helps prevent dog bladder infections, as well as dog bladder stones. Supplements – If you use a product like Vita Pet Life’s Cranberry Supplement, you can prevent many UTIs and possibly bladder stones. An ounce of prevention goes a long way. Medicines – If your Bichon dog is taking Furosemide (Lasix), there is an increased risk for stones to develop. Additionally, if your Bichon is taking steroids for her allergies, she also has a higher risk of developing stones. This is something to discuss with your vet. 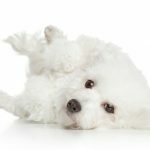 While it is not entirely possible to completely avoid bladder stones in dogs, especially in dogs like the Bichon Frise, you can take steps to minimize the risks. If your dog already has bladder stones, a natural product like Natura Petz Break It Up! could be just what you need. 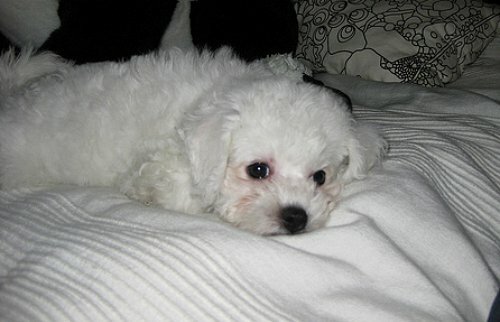 See the most common Bichon Frise health issues here.